The day began in Sutton with sleet and then a thin layer of snow, which soon gave way to freezing cold rain! 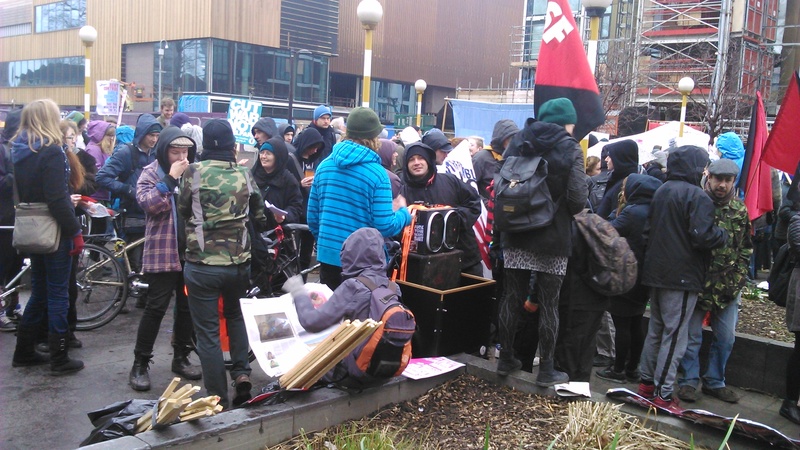 This inclement weather, however, did not deter thousands upon thousands of men, women and children from gathering at two different march starting lines – one in the Elephant and Castle area of South London, and the other in the Shoreditch area of east London. Ordinary people from the length and breadth of the United Kingdom – and many from abroad – gathered to together to march through the deprived working class areas of London to City Hall where the rightwing London Mayor – Boris Johnson – sits in his opulent offices and implements the vicious and brutal cuts in housing, benefits, and services to the most vulnerable citizens under his care, as well as those employed in poorly paid jobs. The Conservative London Mayor takes his orders from the current far-right national coalition government of the Conservative Party and the Liberal Democratic Party (the so called ‘ConDen Nation’), which came to power not through the exercising of choice and true democracy, but rather due to a statistical quirk in Britain’s ‘first past the post’ voting system. Since ther coming to power in 2010, thy have systematically worked to dismantle the UK’s Welfare State (plunging millions into dire poverty), and to privatise the countries National Health Service by selling it to US shareholders and stock-exchange speculators. 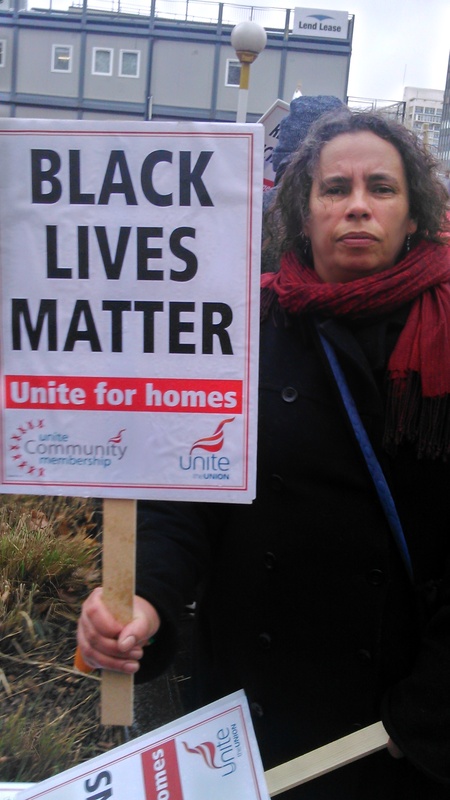 Their rhetoric has demonised the Disabled, Immigrants, Ethnic Minorities, and people of African-Caribbean descent, and has unleashed a police force free from the constraint of concern for basic Human Rights. Even those who choose to live their lives on boats residing on Britain’s waterways have come under take from the London attack on the rights of its citizens. 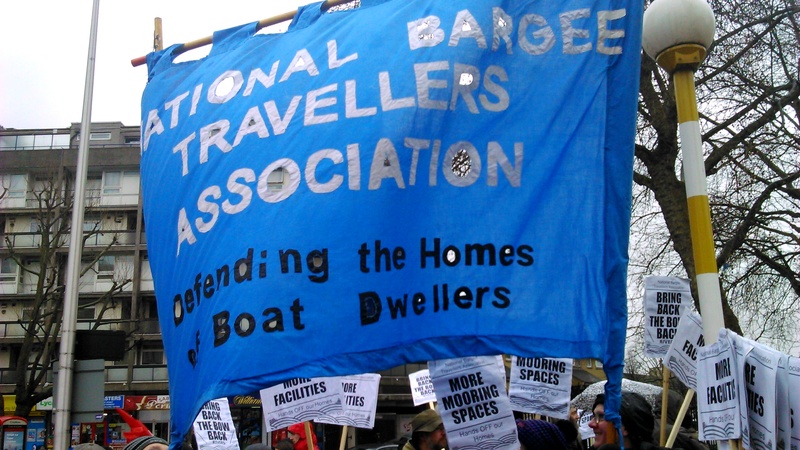 The National Bargee Travellers Association marched with their impressive banner just behind the London District Banner of the Communist Party of Britain, and kept the spirits up of everyone around with their creative and humorous singing and chanting of original slogans and campaigns motifs. Moring space and facilities have been cut for water based travellers, along with welfare restrictions, and other hindrances. The rightwing Lord Mayor – Boris Johnson – believes that only the middle or upper classes should live on the UK’s waterways, and that ordinary people should give-up their established lifestyles and make way for them. With the continuous and relentless diminishing of legal rights for workers and benefit claimants in the UK, poverty has increased immeasurably following the recession caused by the greedy bankers. These middle class parasites have been absolved of any blame for the billions of pounds lost from the country due to their mismanagement of finance. Instead, the poor have their rights eroded, their benefits cut, their wages lowered, their housing choices canalled, and their health care removed. 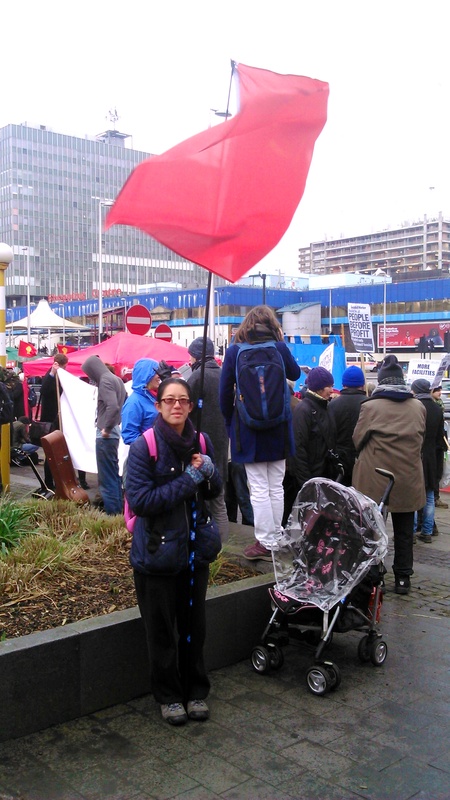 Many Disabled People have had their benefits stopped and have been told to get a job in an employment market that has no place for them, and vulnerable people have been made homeless by the cuts, and some have been driven to suicide or died of starvation. 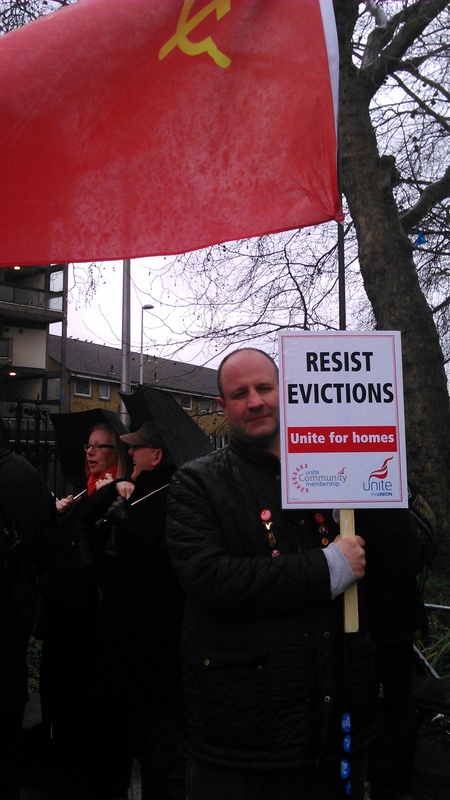 People in record numbers are losing their homes all over the UK, or are struggling to pay their rent and are being evicted. 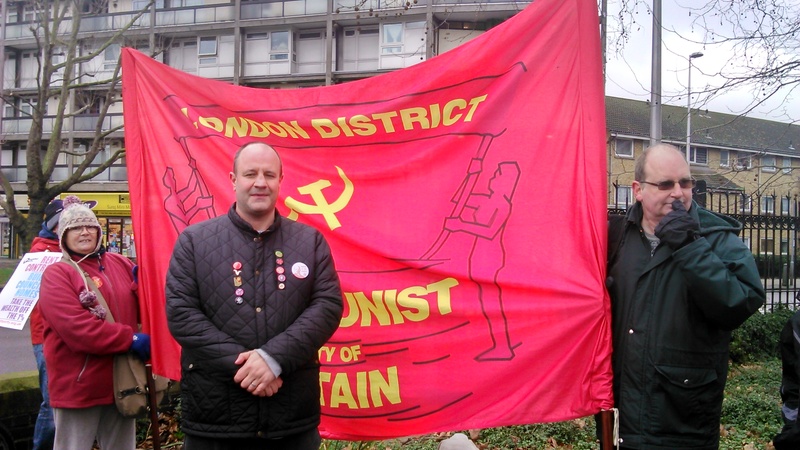 When the march moved through the working class area of London, many residents came out of their homes and held-up supporting placards, whilst others waved and cheered the protestors from their open windows. 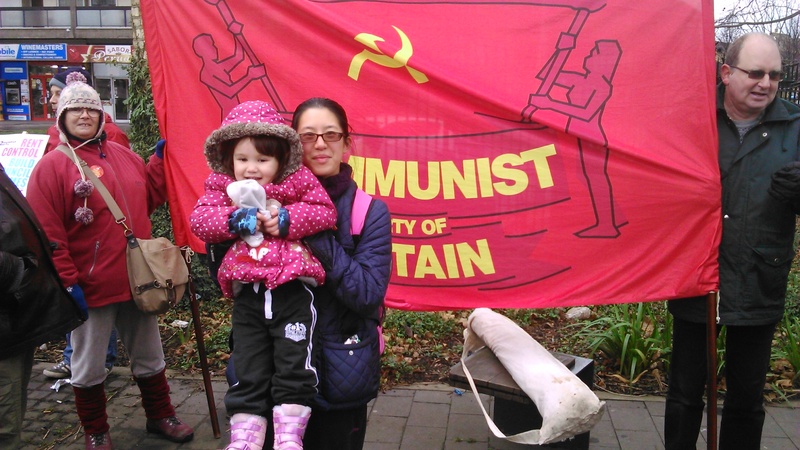 This was a glimpse of the class solidarity that has been crushed down and obscured by a succession of rightwing national governments in the UK – but which is alive and well beneath the surface. In the pouring and freezing rain, thousand of protestors reached City Hall which was surround by hundreds of police officers some of whom were armed. 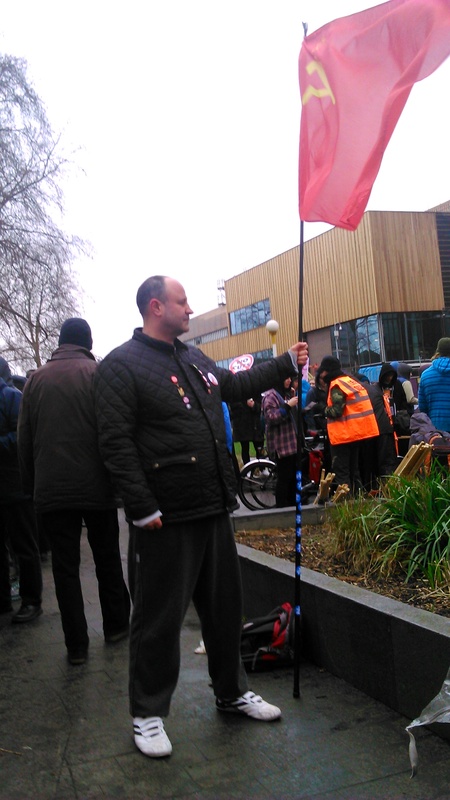 The police presence was obvious, but it kept a discreet distance from the protestors. 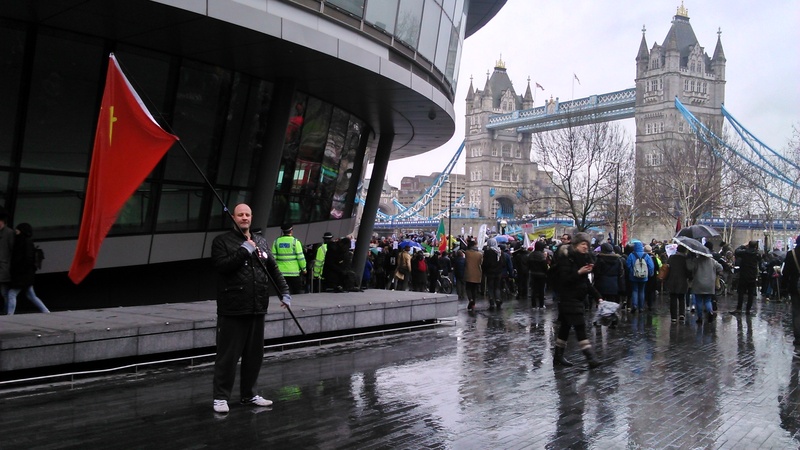 Many people made heart-felt speeches berating the rightwing government and its crony London Mayor Boris Johnson. More misery will unfold next month as the government unrolls its flagship benefit reform of ‘Universal Credit’ which is set to increase the deprivation and suffering of the poorest and most vulnerable people in the UK.